Increase your productivity - easily and quickly. Cleaning up shot blasting debris made easier and more cost effective. What is the shot blasting debris problem? Shot blasting actually has no debris problem, it’s a process problem. Shot blasting machines propel steel shot at surfaces at high speeds and then recaptures most of it…but not all. 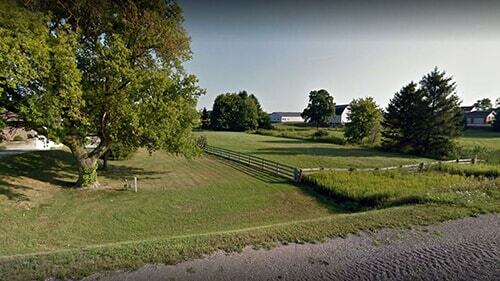 The steel shot that is not recaptured by the shot blasting machine remains on the ground and needs to be picked up. But it’s extremely difficult to pick up and almost impossible to sweep up yet it’s absolutely necessary to pick up this steel shot. The “debris” problem when shot blasting is high and the need for control is also very high. Shot blasting surface preparation animation produced by Blastrac. Why pick up steel shot left on floors? 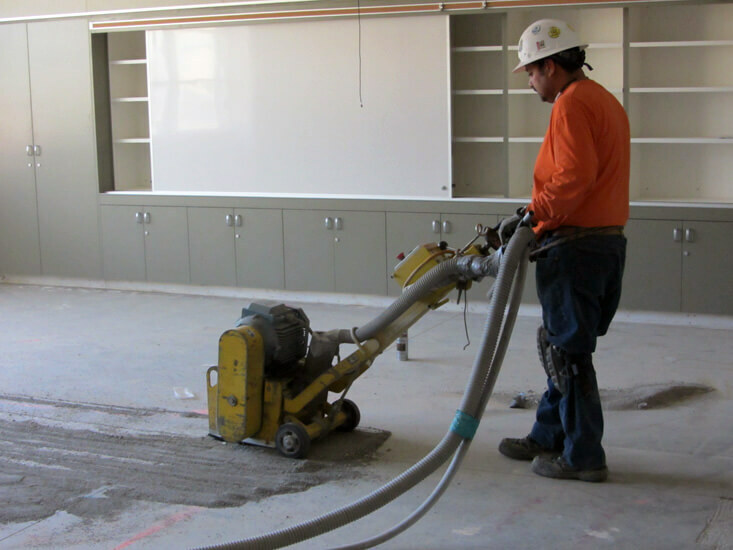 For shot blasting floors in preparation for coating any shot left on the floor will be included in the floor finish and will ruin the appearance of the finished floor surface. Why pick up steel shot left on airfields? 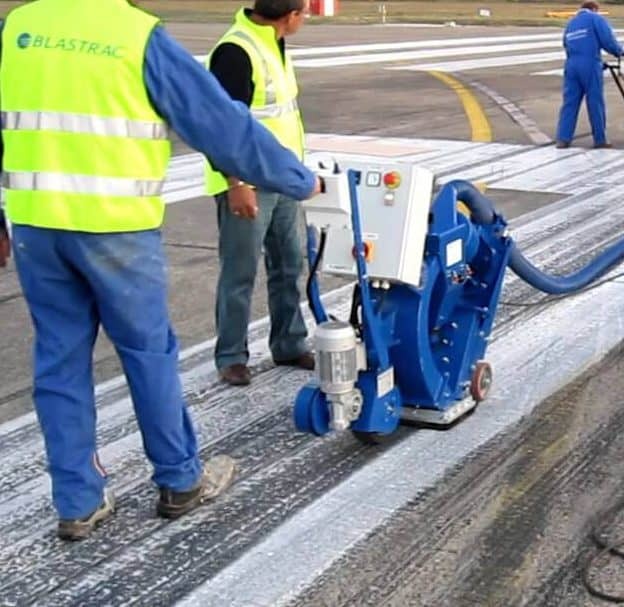 For shot blasting airport runways, all the shot has to be picked up or it becomes airfield FOD and a danger to planes. Why pick up steel shot left on roads? For shot blasting on done on roads during resurfacing or traction control all the shot has to be picked up or it becomes a safety hazard for drivers. 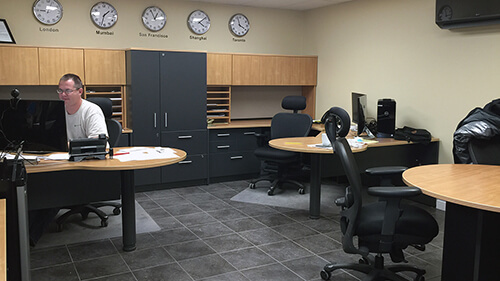 How to Reduce Your Shot Blasting Costs. Steel shot is costly and if it is reused after being picked up it can lower the overall costs of shot blasting. A magnetic sweeper can help collect 100% of the left over shot. 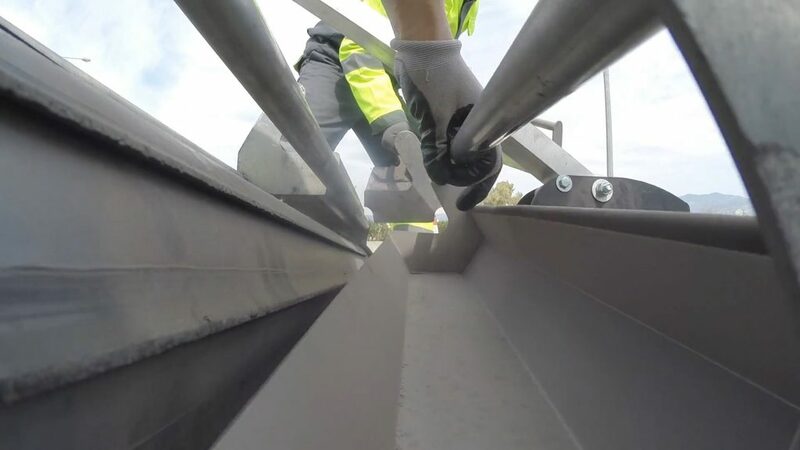 Bluestreak has designed magnetic sweeper options with a shorter payback period in mind and to meet the needs of both the small shotblaster as well as a large shotblasting company. View Shot Blasting Magnetic Sweeper Comparison Chart to compare Productivity, Effectiveness and more. Should you buy the latest technology for picking up shot? 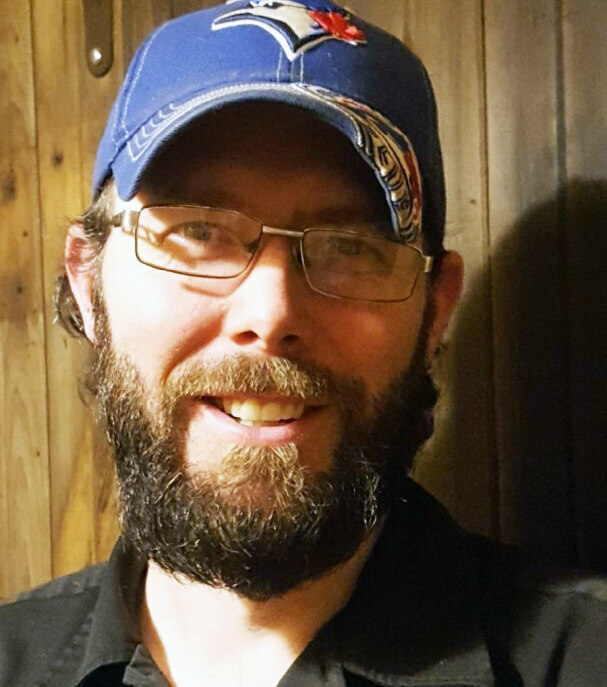 The biggest decision a shot blaster needs to make is whether they do enough shot blasting to warrant the purchase of the latest technology advancement embodied in the “Continuous Discharge” line of magnetic sweepers; the Theta, Fission and Atmos. 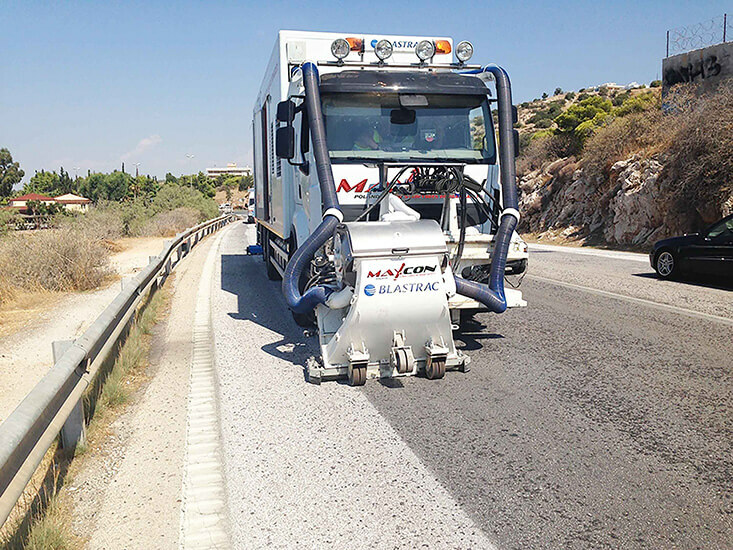 These sweepers are more costly, but offer huge productivity improvements and in some cases increased quality due to the strength of their magnets and ability to remove shot from cracks and joints. Continuous Discharge sweepers also offer huge improvements in operator “ease” of operation. They eliminate much of the constant bending over involved in the operation of traditional magnetic sweepers and it makes performing the task of picking up shot so much easier. It’s like comparing cutting wood with a hand saw versus a power saw. We have compiled the following comparison chart to help with the determination of which shot blasting magnet is right for you. 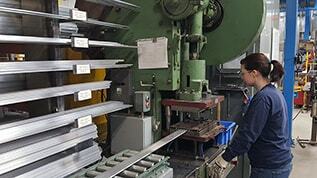 What do the staff of Bluestreak have to say on the subject of shot blasting magnets? The Continuous Discharge Magnetic sweepers (Theta Fission, Atmos) all measure "Maximum Lifting Height" in terms of the depth of floor crack below the wheels that they will pick 100% of the shot out of. 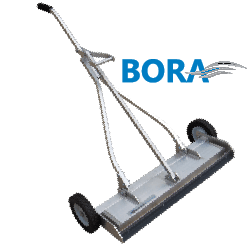 The Bora sweeper doesn't measure maximum lifting height in this way. So the two types of magnets are really hard to compare, they are so different. The Continuous Discharge Magnets, any of them, are just more effective. The big reason for that is obviously the rare earth magnets versus the ceramic magnets in the Bora but also the fact that the Continuous Discharge Magnets are always at full strength because the magnet is constantly being cleaned off as you push it. NOTE: Measuring “Maximum Lifting Height” for Continuous Discharge magnetic sweepers is measured by the depth of the floor crack that the sweeper is able to pick up 100% of the shot. Economical magnetic sweeper for picking up steel shot. Durable, solid push type magnet. The Bora magnetic sweeper is our best push magnet model designed to pick up steel shot on flat surfaces such as concrete or asphalt. The Bora is one of our largest magnets with two layers of C8 ceramic magnets packed end to end for loads of pickup power. The Bora is also designed with a super strong supporting back frame in the form of a 2” by 2” tube welded to both sides to increase the Bora’s durability. 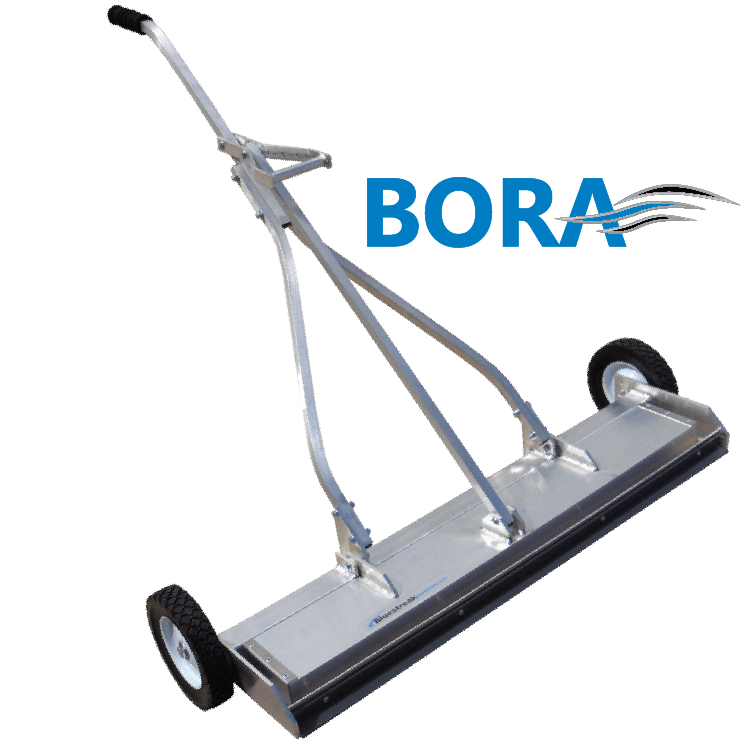 The Bora also comes in a range of 3 sizes and is a versatile economical option for picking up shot. Compact, Light and Easy to Use! 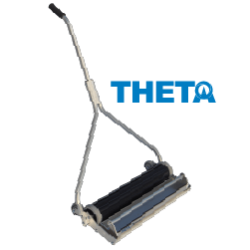 The Theta magnetic sweeper is lighter than most conventional sweepers at only 21lbs making for less tiring work. The Theta, like all the continuous discharge models, uses Bluestreak’s patented Ripwhirl Technology to continuously clean shot off the magnetic drum and is packed with N42 Rare Earth magnets for maximum pickup power. The Theta provides a 40% improvement in clean up time over conventional magnetic sweepers. Perfect balance of size and performance! 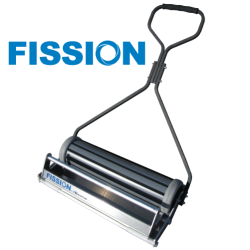 The Fission magnetic sweeper is the same width as the Theta but with twice as many rare earth magnets as the Theta enabling maximum performance at picking up shot out of expansion joints and cracks. The Fission debris holding tray is twice as big as the Theta tray holding approximately 42lbs of steel shot allowing you to cover a larger area before emptying the tray. Because the Fission has more rare earth magnets the overall sweeper is almost double the weight of the Theta. The Fission is 41lbs compared to the Theta at 21lbs. But it is still compact and light enough to make operations easy. Balance of size & performance! Flexible Design for Double Duty! 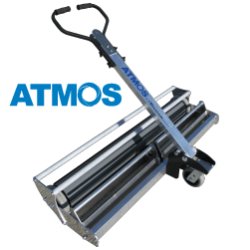 The Atmos magnetic sweeper is a continuous discharge sweeper that is designed for picking up steel shot and covering large areas fast. It has the largest sweeping width at 52″ and 2 debris trays that hold 84 lbs of shot. The most unique feature of this sweeper is the flexible design. 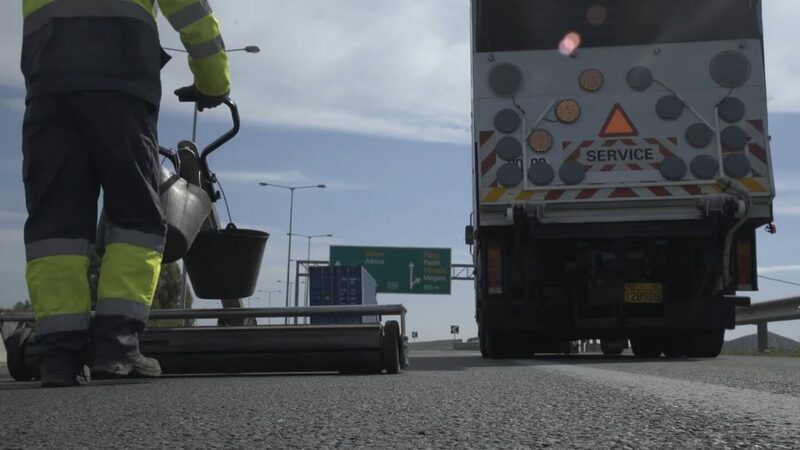 Operators can either push the sweeper like a regular push type magnet or flip the handle and use the sweeper as a tow behind sweeper that can be attached to your vehicles or equipment. Maximum Lifting Height Will pick up 100% of shot from 1" below wheels and decreasing percentage of shot as floor cracks get deeper. Will pick up 100% of shot from 1 3/4″ below wheels and decreasing percentage of shot as floor cracks get deeper. Will pick up 100% of shot from 1 3/4″ below wheels and decreasing percentage of shot as floor cracks get deeper. Sweeper Widths 25”, 31”, or 37” 25" 25" 25"
Sweeper Wheel Type 8" Steel Hub & Ball Bearing Wheels Front has 5" and the rear has 3" Thermoplastic rubber, non-marking wheels with sealed precision bearings. Front has 8" and the rear has 3" Thermoplastic rubber, non-marking wheels with sealed precision bearings. Front has a 6" caster wheels and the rear has 8" Thermoplastic rubber, non-marking wheels with sealed precision bearings.